Do you have a music lover but not sure what instrument they like best? We have the class for you! Check out this multi-instrumental experiential music class. This 30-35 min session gives kids the control to try all instruments, learn the basics, have some fun jamming and then decide what the rock star in them likes! 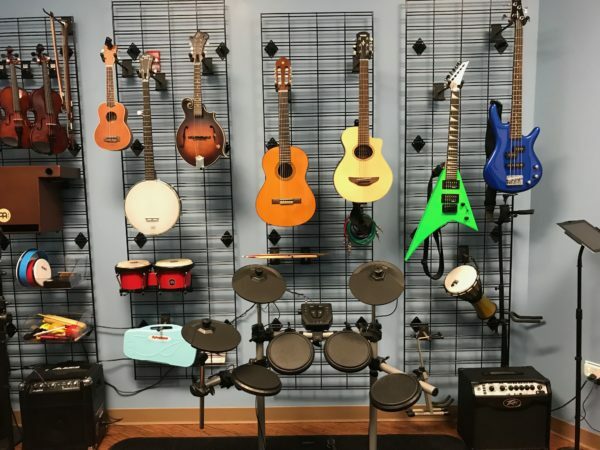 The Music Studio offers instruction on our instruments which include guitar, violin, piano, ukulele, drums, bongo and vocals. Best for kids ages 3-7 years but options for older kids exist on request. Single introductory lesson and 5 or 10 class passes available. Flexible scheduling for your convenience. *Registration allows for day/time choice for your first lesson and a Music Studio Rep will be in touch to confirm your reservation date and time. 5 and 10 session passes will be scheduled together based on availability of both client and instructor. You must register at least 24 hours before the lesson time for us to have time to arrange the instructor. ADVANCE REGISTRATION IS REQUIRED – at least 24 hours in advance. LESSON TIME STARTS WHEN STUDENT ARRIVES AND ENDS AT SCHEDULED TIME UNLESS OTHER WISED AUTHORIZED BY TEACHER AND WILL BE CHARGED IN FULL WITHOUT PROPER CANCELLATION NOTICE. Copyright © 2013 - 2019 Little Beans Cafe. All Rights Reserved.